Well, this is certainly the strictest diet I’ve ever been on, but thanks to my food angel…not yet the most painful one. The week got off to a rocky start due to a stomach bug I caught the night before I was to begin. Thankfully the worst was only one night and the next day I spent recovering, but still able to start the diet and keep the food down. The food has been pretty tasty. I have found a decrease (not yet eliminated) pain in my joints. I’ve had lots of energy. Husband has noticed my hands being smoother (roughness is a sign of my disease)…and I think I’m taking note of it too. Was able to cook a couple meals for my family that I am allowed as well…so I’m learning. Because I’m chasing calories, I feel like my whole day is based around food, thinking of the food, logging the food, seeing that the food is still not enough calories, looking for more food, eating twice as much as I would normally eat and still not reaching my caloric goals. I’ve never been one to snack or make a habit of overeating…so dealing with food fantasies of stuffing my face with every last thing I find in my house that isn’t allowed is a bit disturbing. Because I haven’t been able to up the calories, I’ve opted out of exercise this week (although I plan to do it back to regular levels next week). Joint issues in my left wrist don’t feel very different, it always has been my worst one. Breathing issues feel the same (always on the lookout for that miracle breath!). Still taking nightly epsom salt baths, but plan to take them aways around week 3 or 4 to see how I feel. I don’t want to take too much away at once. Body still heavy at the end and beginning on the day…muscle fatigue still an issue. Three more weeks of elimination remain until it is time to start adding ingredients back in one-by-one. Stay tuned for subsequent updates! 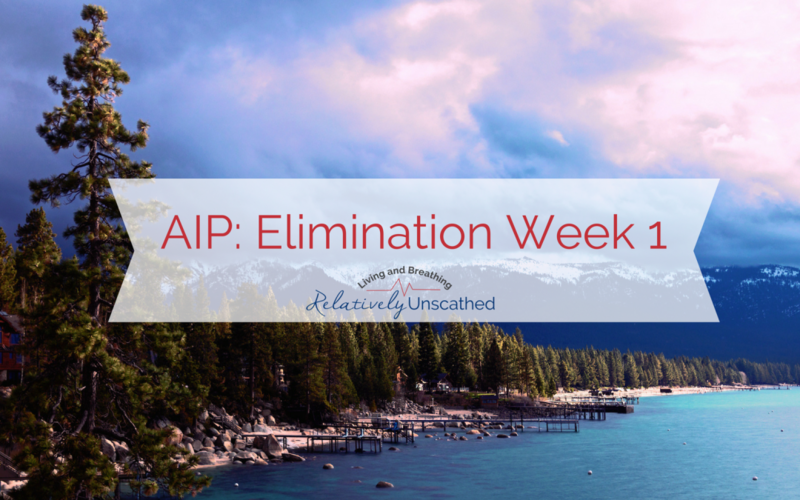 Can you make a list of the doors you are for your week one AIP diet? Hi Sharon, thanks for coming to the blog. Unfortunately, I’m not sure what you mean by “doors you are” perhaps there is a typo I’m not figuring out or a term I’m unfamiliar with. Please explain and I’ll be happy to answer if I’m able.